For a long time I just used regular correction fluid when I wanted to correct my ink lines. But I didn’t like the lack of control nor the smell. I saw someone on-line recommend white gouache, so that became my choice for many years. While I like gouache, it usually takes more than one application to actually cover over the black ink entirely. And it doesn’t work so well with dip pens; I always had to apply it with a brush. For awhile now, I’ve seen mentions of Dr. Ph. 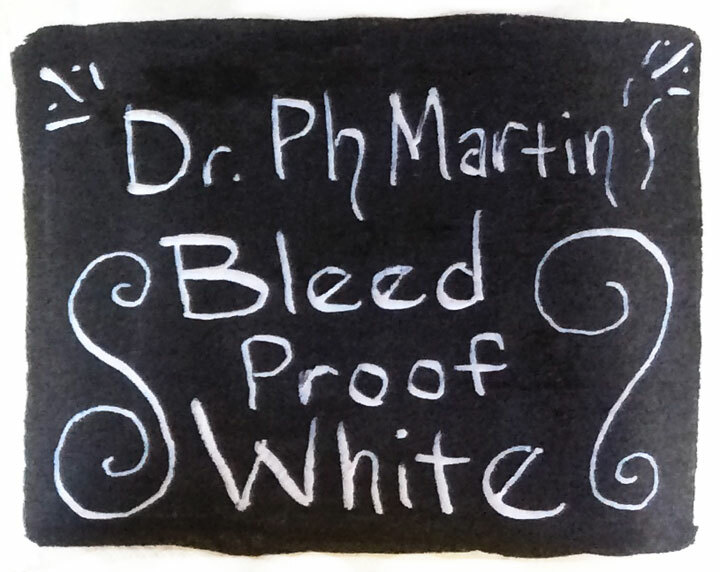 Martin’s Bleed Proof White and I finally broke down and decided to give it a try. It comes pretty thick. So a little water mixed in the top helps it flow better with a dip pen. But it works really well. It stays very white even after it’s fully dried. I’m still just starting out with it, but so far I’ve been very impressed. The only drawback I’ve seen with it is that while it goes on well over black ink, black ink doesn’t go on so well over it. The metal tines of the dip pen nib scrape the white, causing it to flake into the black ink. That said, this is definitely my current choice for fixing my ink work.